OSWEGO, NY – President of the Oswego State Blue Line Club Bob Lloyd and members from the SUNY Oswego Men’s Hockey Team present representatives of Catholic Charities of Oswego County with a donation of more than 100 winter coats. 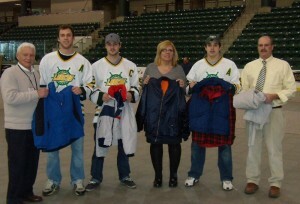 The Blue Line Club collected the coats during two of the SUNY Oswego Men’s Hockey home games at the Campus Center. Catholic Charities will distribute the coats to those in need throughout Oswego County. From left are: Jim Smiley of Catholic Charities, Stephen Mallaro, Kevin Huinink, Helen Hoefer of Catholic Charities, Chris Lananiere, and Bob Lloyd.